Stretching for more than 1200 miles (2000 km) in the Central Pacific, Hawaiian coral reefs account for about 85 percent of all coral reefs in the United States. Because it is under water and not visible, the importance of the reef remains largely hidden - including its importance not only to the ocean environment and its inhabitants, but also to humans. The state of Hawaii consists of eight larger islands (seven of which are populated), also called the Main Hawaiian Islands, and 124 small, uninhabited islands, reefs and shoals, the Northwestern Hawaiian Islands, where the majority of the Hawaiian coral reef, about 70 percent of it, is located. Even though they may appear to be nothing but rock, reefs are alive. Corals give reefs their structure. The limestone skeletons of living coral, the hard skeletal remains of dead coral and a soft type of coral provide structure for a reef, offering habitat and food to the many fish and invertebrates, including lobsters, octopus and crabs that live around it. And algae - more than 500 species live in Hawaii's coral reef alone - not only provide fish with food, but also provide life-sustaining oxygen for all marine life. In fact, the oceans' algae provide more oxygen than all land plants worldwide combined. About one-fourth of the plants, fish, and invertebrates found in the Hawaiian coral reef are endemic to Hawaii, meaning that they can't be found anywhere else on Earth. 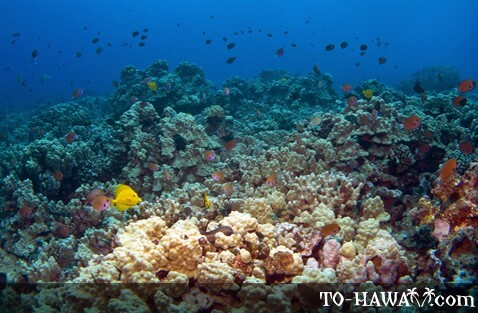 In the past, reef fish provided Hawaiians with the majority of their protein. And, of course, reef fish continue to be a dietary staple for many people inhabiting and visiting Hawaii. In addition to providing humans with food, reefs protect shorelines from erosion and storm damage by dissipating wave energy and limiting the impact of strong waves. Also, the sandy beaches enjoyed by island residents and visitors alike only exist because of Hawaii's coral reef. Beach sand's main components are dead fragments of coral, shells and calcified algae. But the reef is also responsible for creating the big Hawaiian waves. The shape of the reef is one factor in determining how big a wave gets. In addition to all of this, the reef provides diverse recreational opportunities, such as snorkeling and diving, making Hawaii a top tourist destination for people around the world, generating about $800 million a year for Hawaii's marine tourism industry. Despite the coral reef's importance, it suffers from degradation that began about 100 years ago as Westerners began to arrive in ever-increasing numbers. Today, urbanization, overfishing, alien species, marine debris and recreational overuse plague the Main Hawaiian Islands, while marine debris and the impacts from fisheries are causing problems in the uninhabited Northwestern Hawaiian Islands, although their nearshore reefs are still in very good condition. Unlike the more inaccessible Northwestern Hawaiian Islands, the Main Islands face a host of concerns related to population growth, urbanization and an increase in tourism. Urban development and agriculture are the most significant threats to Hawaiian coral reefs because of runoff containing sediments (soil and silt) and chemicals and nutrients from lawns, farms, golf courses, construction sites, storm drains, cesspools and septic tanks. Sediment runoff is bad because it reduces sunlight penetration and smothers corals. The reef then starves to death because it can't manufacture food from sunlight any longer. Chemical herbicides and pesticides harm not only the coral, but also the animals that live within the reef, while fertilizers and sewage can lead to an overabundance of nutrients in the water and an excessive growth of algae which, in turn, crowds out corals or smothers them by cutting off their sunlight. Commercial, subsistence and recreational fishing during the past century have taken a toll on nearshore fish stocks, but the exact toll isn't known. There is uncertainty of the actual number of catches because commercial fishers tend to under-report their catches, and there are many recreational and subsistence fishers without licensing or reporting requirements. The problem of recreational and subsistence fishing is difficult to resolve because these activities are important in Hawaii, where about 35 percent of Hawaiian residents fish. As a result of both under-reporting and unlicensing, little information exists on the status of most reef fish populations. Yet some studies done in Hawaii have shown that recreational fishers take a higher diversity of species with a wider variety of gear types than do commercial fishers and that recreational catches were equal to or greater than the commercial catches for some species. Commercial fishing without a license, or poaching, is another problem for the Main Hawaiian Islands. If fishers take undersized fish and invertebrates, or fish out of season, it hurts the ocean environment because these juvenile animals haven't had a chance to reproduce, yet. Moreover, long, inexpensive gill nets allow fishers to set nets deeper and harvest fish in areas once unreachable by fishers' nets. Overfishing and poaching mainly occur because Hawaii lacks marine enforcement and imposes minimal fines when enforcement does occur - meaning that there is no incentive for people to abide fisheries management regulations. As for the Northwestern Hawaiian Islands, their remote location largely protects them from the harms linked to commercial, subsistence and recreational fishing, as well as from the harms linked to aquarium fishing. However, underwater overfishing in these islands is leading to a decline in lobsters, and a decline in lobsters endangers the Hawaiian monk seal, for which lobsters are an important food source. Although Hawaii is a popular tourist destination and welcomes visitors, recreation - including snorkeling, scuba diving and swimming - can compound the reefs' struggle to survive. Marine debris, such as discarded fishing gear, can damage the reef, as can waste dumping from cruise and other pleasure ships. And taking a dip in a reef simply to admire its beauty has its drawbacks as well, because so many of us like to do that. In fact, this type of recreational overuse threatens the reef. Whether by accident or by intention - stepping on reefs can damage or even kill them. A notable example of solving the problem of recreational overuse can be found in Hanauma Bay, known as Oahu's premier spot for snorkeling and diving. During the 1980s, as many as 10,000 visitors enjoyed the bay daily, or about 3 million annually. Then, in 1990, the City and County of Honolulu enacted a plan to stop the neglect, restore the bay to a healthy state and safeguard the fragile marine life for the future. The plan includes a fish feeding ban, a requirement that all visitors view an educational video before going down to the bay, a ban on fishing, as well as a ban on smoking and alcoholic beverages. Furthermore, the city bus service to the bay is limited now to one bus arrival every half-hour. Parking along Kalanianaole Highway, which leads to the bay from Honolulu and from Oahu's northeast side, was also prohibited. As a result of these regulations, the number of visitors dropped from 10,000 in the 1980s to 3,000 visitors daily today, or from about 3 million annually during the 1980s to about 1 million annually today. This has led to the bay's recovery, with the biomass now measuring three to four times larger than the estimated abundance for most reef sites on Oahu. Because of Hawaii's unique ecosystem, where many species are endemic and the reef is diverse, alien species pose another threat. Alien species are organisms that have been moved from their native habitat to a new one, where they cause harm, sometimes out-competing native species or bringing new parasites and diseases with them, while native species lack defense systems to ward off the effects of these threats. Since 1950, 19 new species of macroalgae have been introduced to Oahu, and studies show that these alien algae have overgrown and killed some coral in Kaneohe Bay on Oahu's southeast coast. Sometimes, the effects of an alien invasion can completely alter an ecosystem. According to one study, a combination of invading alien species and runoff has led to massive blooms of foreign algae, with the result that they have overtaken native algae and reduced the diversity and complexity of some coral reef beds (Eldredge, Reaser: Coral Reefs: Invaded Ecosystems). Beyond the need for fish as food, the human desire to possess fish and other marine life for their beauty also takes toll on Hawaii's coral reef. The U.S. aquarium fish industry reports that it obtains most if its ornamental fish and invertebrates from Hawaii's waters. The annual harvest of aquarium fish in Hawaii more than quadrupled in a little more than 20 years, going from 90,000 harvested in 1973 to 422,823 in 1995. Aquarium harvesters often destroy reef habitat when they collect sessile benthic invertebrates, such as the feather-duster worm, which lives attached on the bottom of the sea floor. In 1998, the Hawaii state legislature passed a law because of conflicts among aquarium fish harvesters, commercial and subsistence fishers and environmentalists. The law declared a minimum of 30 percent of the west Hawaii Island coastline as Fish Replenishment Areas (FRAs) where aquarium fish collecting is prohibited. 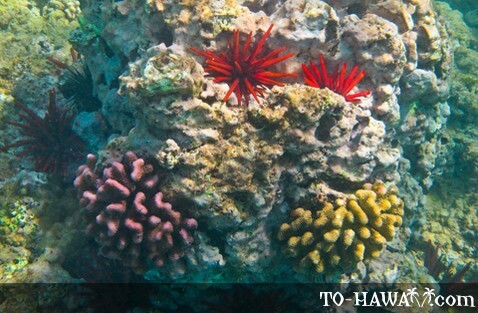 What can be done to protect Hawaii's coral reefs? To help safeguard Hawaii's fragile coral reef ecosystem, there are ways to get actively involved in reef protection programs. Volunteers are always needed for reef and beach clean-ups. Moreover, there are a few simple things each one of us can do. At home, residents can cut down on their use of fertilizers, pesticides and cleaning products that mostly contain chemical ingredients to limit water pollution. While fishing, it is best to limit the catch and to only take what is needed today. Don't release non-native or aquarium fish into the ocean. It can also be harmful to throw waste in the water, or to discard old fishing nets. Even littering on the beaches can pose a threat because it can get washed into the ocean and harm the reef. Boat anchors shouldn't be thrown on the reef, but only on a sandy bottom. And lastly, while swimming, snorkeling, and scuba diving, it is best to not touch the reef or step on it since that can harm or even kill it. If each one of us followed these simple guidelines, the reef wouldn't be as threatened as it currently is. This colorful underwater paradise will then be there for many generations to come. Coral reef: An erosion-resistant marine ridge or mound consisting chiefly of compacted coral together with algal material and biochemically deposited magnesium and calcium carbonates. Shoal: A sandy elevation of the bottom of a body of water, constituting a hazard to navigation; a sandbank or sandbar. Degradation: A decline to a lower condition, quality, or level. Gill net: A fishing net set vertically in the water so that fish swimming into it are entangled by the gills in its mesh. Biomass: The total mass of living matter within a given unit of environmental area. The total mass of all living things within a given area, biotic community, species population, or habitat; a measure of total biotic productivity. Macroalgae: Photosynthetic (chlorophyll-containing) organisms often referred to as seaweed. Multicellular algae: (green, blue-green and red algae) having filamentous, sheet or mat-like morphology. Herbicide: A chemical substance used to destroy or inhibit the growth of plants, especially weeds. Pesticide: A chemical used to kill pests, especially insects. Fertilizer: Natural and synthetic materials spread on or worked into soil to increase its capacity to support plant growth. Feather-duster worm: Feather-duster worms are native to the Pacific and Indian Oceans. Similar species can also be found along the southern coast of the United States, and in the Bahamas and the West Indies. The Feather-duster worm normally grows to a length of about 4 or 5 inches (10 or 12 centimeters). It resides in a leathery tube, which is made of secretions from the Feather Duster itself. Sessile: Permanently attached or fixed; not free-moving. Benthic: The collection of organisms living on or in sea or lake bottoms.